His Majesty King Philippe of Belgium Attends the 11th Edition of the Prix Belgodyssée. 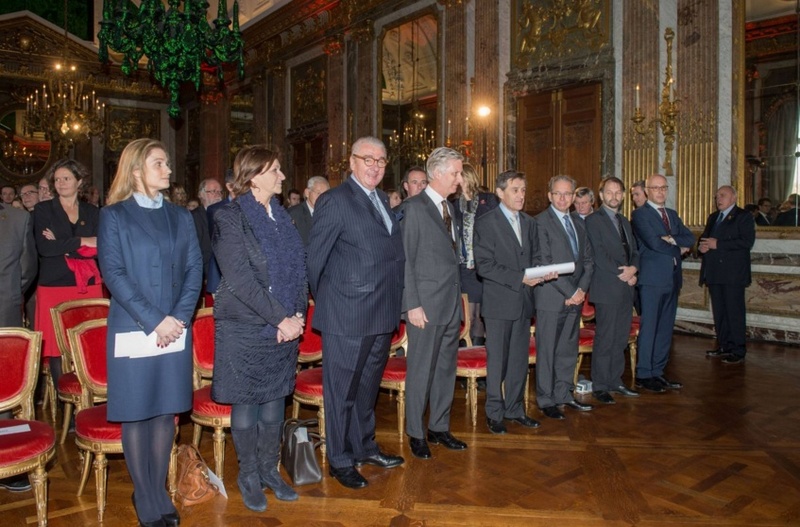 On the afternoon of Thursday, December 10, 2015, His Majesty King Philippe of Belgium attended the 11th Edition of the Prix Belgodyssée for Young Journalists held at the Palais Royal in Brussels. Established in 2004, the Belgodyssée is an initiative of Belgian Public Radio network, VRT VivaCité, and the Fonds Prince Philippe, in collaboration with the Belgian newspapers Metro and L’Avenir as well as with the support of the Chancellerie du Premier Ministre and Brussels Airlines. The overall goal of the prize is to promote collaboration among future journalists of the three communities within the country. Held under the theme, New Forms of Solidarity, sixteen young journalists traveled throughout Belgium producing variety of reports for radio and print media while sharing their experiences on social media. Previous Christmas in the Castle with Prince Gustav of Sayn-Wittgenstein-Berleburg. Next (VIDEO) HRH The Duchess of Cambridge Visits CATS in Wiltshire.